The Chinese support base in Djibouti is a military base operated by People’s Liberation Army Navy (PLAN) of the People’s Republic of China at Djibouti in the Horn of Africa. It is the first overseas military base of the PLAN, and was constructed west of Djibouti City, adjacent to the Port of Doraleh. The base was financed primarily by China, costing US$590 million. The facility is expected to significantly increase China’s power projection capabilities in the Horn of Africa and the Indian Ocean. The United States Navy operates its only permanent overseas naval base on the African continent at Camp Lemonnier in Ambouli on the southern side of Djibouti–Ambouli International Airport; the Japan Maritime Self-Defense Force also operates its only overseas base adjacent to Djibouti–Ambouli International Airport. The current base commander is Liang Yang. Sources close to the People’s Liberation Army have confirmed to the South China Morning Post that a Chinese naval port is being built at a strategic location on Pakistan’s southern coast. 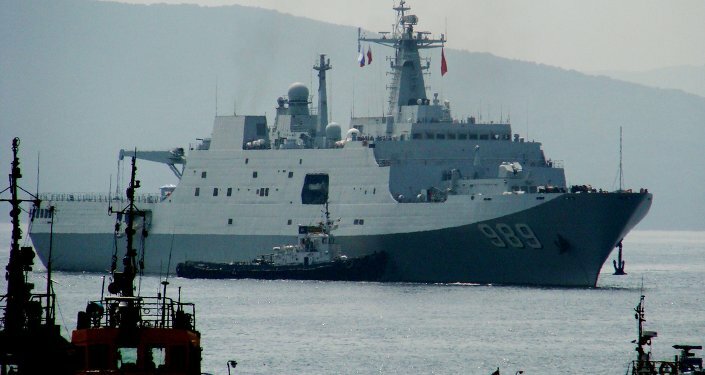 „China needs to set up another base in Gwadar for its warships because Gwadar is now a civilian port,“ Zhou Chenming, a Chinese military analyst, told the South China Morning Post on Friday. „Gwadar port can’t provide specific services for warships,“ Zhou said; hence the need for a new base. Gwadar is less than 50 miles east of the Pakistan-Iran border and sits in Balochistan Province, where fiercely independent Baloch nationalists have waged guerrilla wars against both the Pakistani and Iranian governments. „Public order there is a mess,“ Zhou said. „China and Pakistan have found common ground in terms of maritime interest in the region,“ Pakistani analyst Sheikh Fahad says. „Gwadar port can be used for joint naval patrols in the Indian Ocean, further increasing the naval outreach of China and Pakistan in the region. Gwadar port will increase the countries‘ naval movements and further expand defense cooperation, especially in the naval field,“ Fahad noted. In mid-December, Lawrence Sellin, a retired US Army Reserve colonel, reported for the Daily Caller that high-ranking Chinese and Pakistani officials had met in Beijing to discuss future projects. Last June, a Pakistani diplomat said China’s help was needed as an „equalizer,“ pointing to the naval base as all-but-inevitable. „Previously it was the US and Saudi Arabia… Now it’s China,“ the diplomat told NBC. A Chinese Defense Ministry spokesman later dismissed the report as „pure guesswork,“ but now it seems the port will, in fact, be built. Experts have noted that India is keeping a close eye on the development of China-Pakistan relations. „China finds it very useful to use Pakistan against India and ignore India’s concerns, particularly on terrorism issues. That has created a lot of stress in the relationship between Beijing and Delhi,“ Rajeev Ranan Chaturvedy, a researcher at the National University of Singapore, told SCMP. But „Indian naval capabilities and experience in the Indian Ocean region are fairly good — much better than Pakistan and China,“ Chaturvedy said. N00813, Equation and Hendrik_2000 like this. According to sources, the large naval and air base will require the Pakistani government to relocate scores of residents living in the area. Plans call for their relocation to other areas of Jiwani or further inland in Baluchistan province. The Chinese also asked the Pakistanis to undertake a major upgrade of Jiwani airport so the facility will be able to handle large Chinese military aircraft. Work on the airport improvements is expected to begin in July. The naval base and airfield will occupy nearly the entire strategic peninsula. Jiwani will be China’s second major overseas military base. In August, the PLA opened its first foreign base in Djibouti, a small African nation on the Horn of Africa. The Pentagon has dubbed China’s foreign military basing ambitions the “string of pearls” strategy. The Chinese are planning to set up bases along a line of states stretching from the Persian Gulf through the Indian Ocean and Southeast Asia. Pentagon officials, however, regard the Djibouti base and the future second base at Jiwani as part of efforts to control oil shipping in and out of the Persian Gulf and the Red Sea. Both Chinese bases are located near strategic chokepoints — Djibouti near the Bab el Mandeb on the Red Sea and Jiwani close to the Strait of Hormuz on the Persian Gulf. Pakistan’s military also has been moving additional troops and security forces into nearby Gwadar, where China has invested heavily in building a commercial port and other infrastructure projects. “They give safe haven to the terrorists we hunt in Afghanistan, with little help. No more!” Mr. Trump tweeted. Reuters reported that China’s investment has included $500 million in grants and $230 million for an international airport. China is also promoting what Beijing calls the Belt and Road Initiative, a development program of land and sea routes over 60 nations in Asia, Europe and Africa. As part of that initiative, China plans to turn Gwadar into a megaport for transshipping goods worldwide, along with energy pipelines, roads and rail links connecting to western China. Chinese naval and air forces at nearby Jiwani would then provide protection for that base. China also has leased a port on the Indian Ocean island of Sri Lanka that recently opened at Hambantota. The facility has raised concerns in India that views China as a growing regional and global threat. Dolcevita, N00813, Equation and 1 other person like this.